Purchasing a house can be a very difficult time. Not only do you have to worry about getting the home for the right price, but then you have to worry about home inspection, securing financing, and then finally, the closing. However, when it comes to purchase agreements, what happens when the seller changes their mind and decides they no longer wish to sell the house to you? What Is a Real Estate Breach Of Contract? When Can Seller Legally Breach the Contract? What Is a Real Estate Breach of the Contract? Accordingly, during the time between when the contract is signed and the actual closing, both parties have a number of duties to accomplish, which typically lasts a period of 30 to 45 days. Until the closing, however, if there is a case of the seller backing out of real estate contract, the buyer may then have a legal claim against the seller for a breach of real estate contract by seller. The Seller may try to backtrack on their sale to the Buyer after they received a higher offer from another potential buyer. However, instead of being honest about this, they will try to get out of the sale by breaching the contract so they won’t have to sell you the house. Occasionally, the Seller may have Sellers remorse and wish to keep the property for a variety of reasons. This may include keeping the home so they can pass it to a family heir or they may want to wish to keep it as a rental unit. Sometimes the reason why the Seller is selling their home is because they had a new job offer and they had planned to move. However, if the job offer fell through, the Seller then, obviously, is reluctant to sell their home given the new situation. Having an “escape clause” or particular “contingency” in the contract will give the Seller backing out of the real estate contract validity and not have to sell the Buyer their home. The clause will set up a set of circumstances, often very generous to the Seller, that may allow the Seller the opportunity to cancel the contract at any time. Accordingly, before any real estate contract is signed, it is important that it is thoroughly reviewed and edited to prevent this from happening. When Can a Seller Back Out of a Home Sale? As we discussed earlier in this article, if the Seller has an “escape clause” or “contingency clause” in the agreement, then they will be able to cancel the contract for any reason, so along as the escape or contingency clause is worded properly to allow such an “escape.” Furthermore, these clauses may not be easy to spot, will not necessarily be bold or in a separate paragraph, and may just be a few sentences contained within an existing paragraph. This may not sound fair to the Buyer, which is why it’s very important for the Buyer to have an experienced real estate attorney carefully review each clause and go line by line to review and find such escape clause verbiage. After the Buyer conducts a “home inspection,” they generally request some type of repair(s) to be made, from something as important to cleaning mold in the attic or exterminating termites, to something as minor as repairing an electrical outlet. However, should the Seller refuse to make such repairs, the Buyer is forced to either withdraw their requests or, realistically, decide that they don’t want to continue with the purchase. This scenario too, depends on the verbiage of the contract. The Seller is under no obligation to sell their house to you if there is not a valid signature by all parties to the purchase and sale agreement, a/k/a real estate contract. If the Buyer doesn’t meet their own contractual obligations, the Seller may terminate the contract and not suffer any legal consequences for their own breach. For example, if the contracts includes a timeframe on when the Buyer must secure financing or a mortgage, and the Buyer fails to do so, generally, the terms of the contract will state that the Seller may withdraw from the sale of the contract without repercussion so that they may attempt to locate another buyer. Specific performance is a specialized remedy used by courts when no other remedy (such as money) will adequately compensate the other party. … When a contract is for the sale of a unique property, for instance, mere money damages may not remedy the purchaser’s situation. To achieve specific performance, a suit for specific performance is filed with the court, in which the court will then order the Seller to perform or, in some cases, not perform, some sort of action. This is usually done when the court orders the Seller to not sell the property to any other party while the litigation is still pending. A liquidated damages clause specifies a predetermined amount of money that must be paid as damages for failure to perform under a contract. 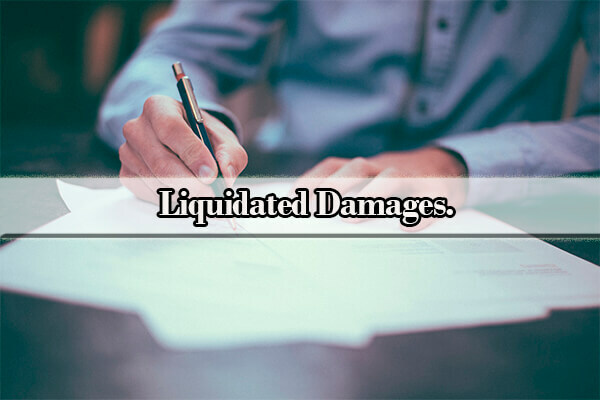 The amount of the liquidated damages is supposed to be the parties’ best estimate at the time they sign the contract of the damages that would be caused by a breach. In order for liquidated damages to be enforceable, however, they cannot act as a form of punishment against the breaching party. It will only be enforceable if it is determined that calculating actual damages for the particular breach at issue is difficult and the liquidated damages are reasonable under the circumstances. An example of liquidated damages is usually seen in which the Buyer breaches the residential contract, and the Seller is allowed to sell to another new Buyer, but also keep the previous breaching Buyer’s deposit. The Buyer may also seek to end the contract themselves, not purchase the home, and just move on. In these types of situations, the Buyer is refunded their deposit as well as expenses incurred during the failed transaction such as attorney fees, survey fees, title inspection fees, and other costs of examination. The return of fees and expenses is often negotiated during the settlement stages of the contract breach. How Is a Breach of a Real Estate Contract Resolved? Oftentimes, real estate purchase contracts will contain a provision dictating how a dispute regarding the real estate contract is resolved. One method of resolution is Arbitration. Arbitration is a procedure in which a dispute is submitted, by agreement of the parties, to one or more arbitrators who make a binding decision on the dispute. In choosing arbitration, the parties opt for a private dispute resolution procedure instead of going to court. Accordingly, the arbitrator’s decision is final via contract, but does not represent the opinion of the state court. The benefits of Arbitration is that it may avoid hostility because the parties are encouraged to work together peaceably. It is usually less expensive than court litigation, it’s faster than litigation, more flexible and therefore does not concern itself with formal rules of evidence and procedure. Another method of resolution is Mediation. Mediation is a procedure in which the parties discuss their disputes with the assistance of a trained impartial third person(s) who assists them in reaching a settlement. The mediator is independent and advocates for both the Buyer and Seller. By going back and forth, their job is to attempt to try to come up with a compromise that each party can live with. A mediator’s decision is not final unlike that of an arbitrator. The third method of resolving a breach of contract case is for the Buyer to sue the Seller in court for breach of contract. This is a court method that involves the Buyer filing a complaint against the Seller for breach of contract and the Seller responding with an answer. In this method, the Court will decide if a breach of contract occurred by Seller and what damages, if any, are awarded to Buyer. If the Seller broke their contract with you, you need to contact an experienced real estate attorney right away and inform them of the facts, as to what happened, and your thoughts and feelings of the actual reason why the Seller broke the contract. Maybe it’s because they found another buyer who offered more money for the property? Maybe it’s because they thought they would be leaving for a new job, but the new job fell through. Whatever the reason, your attorney will review the existing contract that was signed and look for any legal loopholes to determine if the Seller had a valid reason for breaking the contract. They will then review your case with you and present to you the best legal remedy on how to proceed and what route you should go. Q: Can a Seller Back Out After Inspection in New York? A: Yes. In New York, the home inspection is conducted before the Buyer signs the purchase and sale agreement. Accordingly, since there is no signature binding the Seller to the sale of the home, the Seller has no obligation to Buyer and can back out at any time and for any reason. Q: Can a Seller Back Out of a Contract Before Closing Date? A: If the Buyer doesn’t complete the terms of their contract prior to closing, most common of which is not securing financing or their mortgage by a certain time frame, then Seller is free to back out of the contract prior to closing date. Q: Can a Seller Back Out of a Home Sale Before Closing in NYC? A: Again, if the Buyer fails to meet their end of the agreement prior to closing, then the Seller is free to back out of the home sale. This may occur when a seller must spend over a set dollar figure, per the contract, to cure liens or judgments to procure a marketable title for the buyer, and the seller refuses to do so. Q: Can I Get Inspection Fee Back, If The Seller Backed Out? A: It depends! If the Seller breached the contract without a valid legal reason and you are out of pocket your home inspection costs, then you may be able sue the Seller in small claims court for breach and claim reimbursement for your home inspection costs and fee. Q: How Much Can You Sue For Breach of Contract? A: Real estate transactions are a dime a dozen, each case is unique and brings with them their own particular facts and problems. However, since we’re dealing with real property, the amount of damages are extremely fact specific and will depend on the costs, expenses and lost earnings. The court can also force the sale of the property via specific performance. Q: What Happens When Seller Breaches the Contract? A: The Buyer has a number of remedies for breach of contract against the Seller. This includes money damages, liquidated damages, terminating the contract and being reimbursed out of pocket expenses, and specific performance, which means that in lieu of money, the court will order the Seller to perform or not perform a certain action. Q: Can a Seller Back Out of a Purchase Agreement? A: Can a seller back out of a contract? There are a few legal reasons when a Seller can back out of a contract. When the contract was not signed, Buyer doesn’t adhere to contract terms, there is a contingency clause that was not satisfied, or if there is an escape clause, then the Seller can back out without repercussions. It is always best to consult an attorney with your particular facts. Q: Can a Seller Accept Another Offer If He Already Signed a Contract? A: Can seller cancel purchase agreement? No. The Buyer may then sue the Seller for breach of real estate contract. Q: What Can a Foreclosure Attorney Do to Help? A: An experienced real estate attorney understands the real estate buying process and the law. With this information, they are able to analyze real estate contracts, apply your set of facts to the law, and provide you with the best course of action against a real estate breach of contract. You need to discuss with a competent and experienced real estate attorney to discuss how to proceed when the Seller breaches the contract. A qualified real estate lawyer from the Law Office of Yuriy Moshes has the expertise, legal knowledge of the real estate process, and can provide you with sufficient and easy-to-understand legal advice. We help Buyers in the New York City area including all its boroughs (Manhattan, Brooklyn, Queens, the Bronx and Staten Island) as well as Northern New Jersey, Long Island, and Upstate New York.